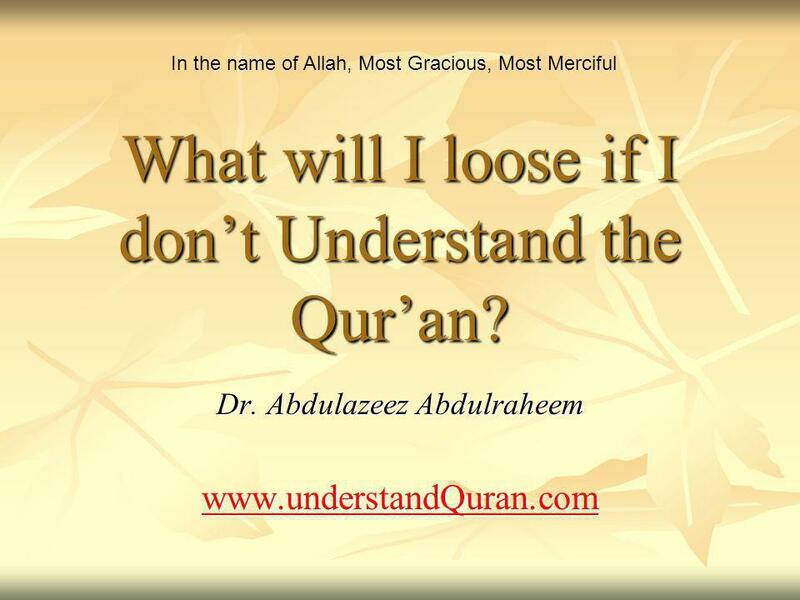 What will I loose if I dont Understand the Quran? Dr. Abdulazeez Abdulraheem www.understandQuran.com In the name of Allah, Most Gracious, Most Merciful. 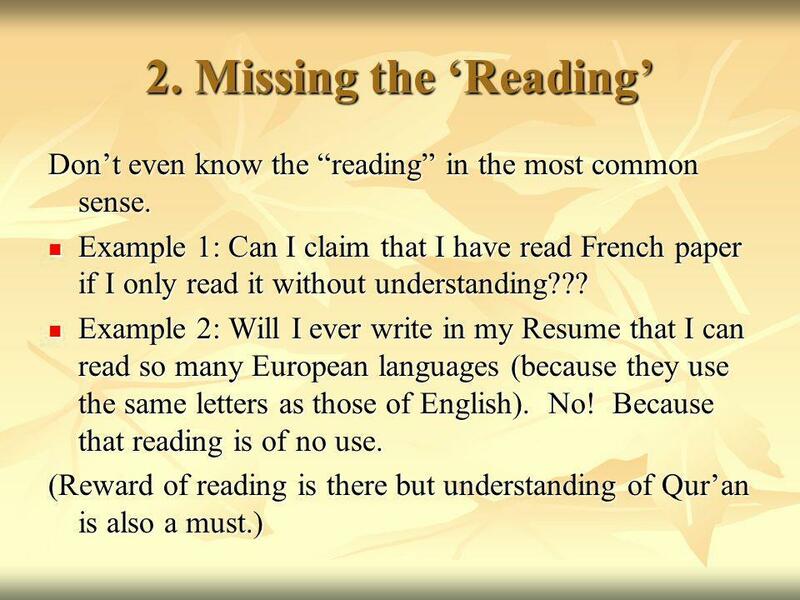 2 Here are just some of the things that I loose if I dont understand the Quran DIRECTLY IN ARABIC. (May Allah help us avoid them all). 3 1. 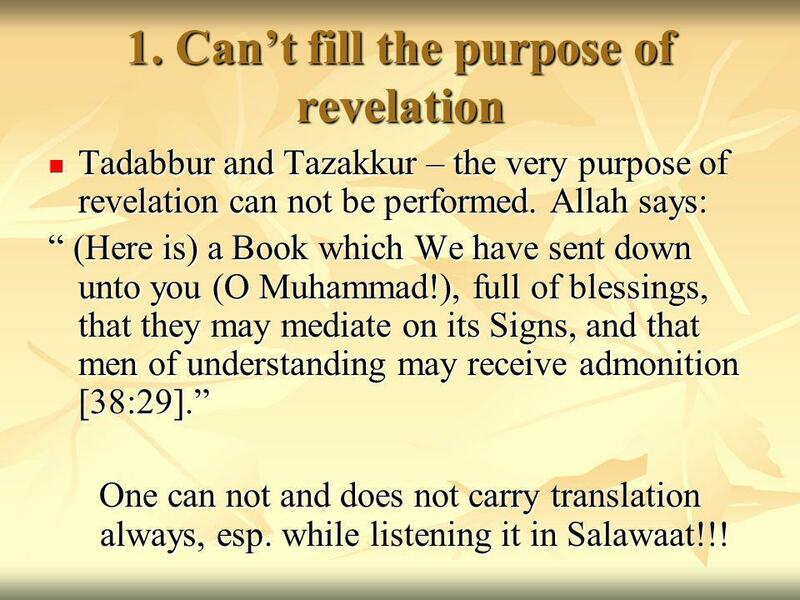 Cant fill the purpose of revelation Tadabbur and Tazakkur – the very purpose of revelation can not be performed. Allah says: Tadabbur and Tazakkur – the very purpose of revelation can not be performed. Allah says: (Here is) a Book which We have sent down unto you (O Muhammad! ), full of blessings, that they may mediate on its Signs, and that men of understanding may receive admonition [38:29]. (Here is) a Book which We have sent down unto you (O Muhammad! ), full of blessings, that they may mediate on its Signs, and that men of understanding may receive admonition [38:29]. One can not and does not carry translation always, esp. while listening it in Salawaat!!! 5 3. Garden of mind … The mind is like a garden. If you dont sow flowers, weeds will grow. The mind is like a garden. If you dont sow flowers, weeds will grow. Even if you sow flowers, weeds will still grow. You will need to remove the weeds continuously. Even if you sow flowers, weeds will still grow. You will need to remove the weeds continuously. 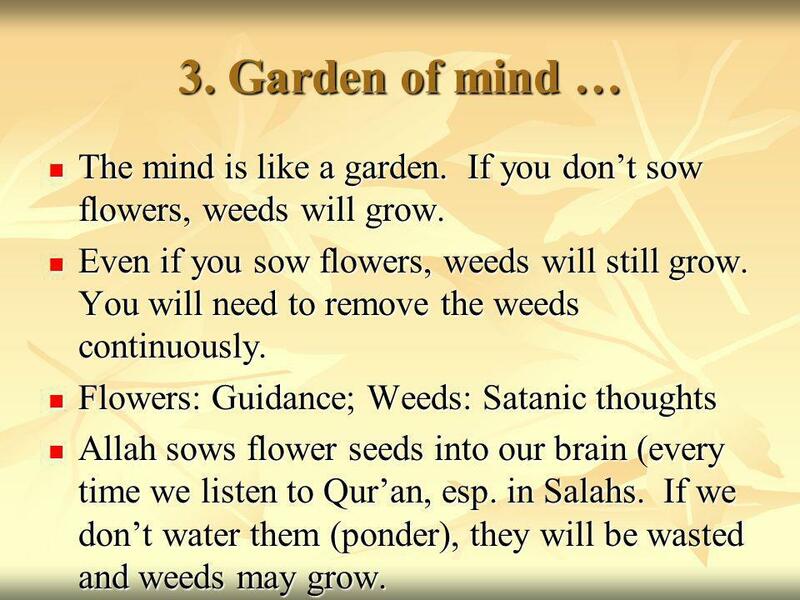 Flowers: Guidance; Weeds: Satanic thoughts Flowers: Guidance; Weeds: Satanic thoughts Allah sows flower seeds into our brain (every time we listen to Quran, esp. in Salahs. If we dont water them (ponder), they will be wasted and weeds may grow. Allah sows flower seeds into our brain (every time we listen to Quran, esp. in Salahs. If we dont water them (ponder), they will be wasted and weeds may grow. 6 4. Not fulfilling objectives of Recitation There are 5 objectives: 1. Reward 2. Knowledge 3. Action 4. Shifaa (cure) of hearts and minds. 5. 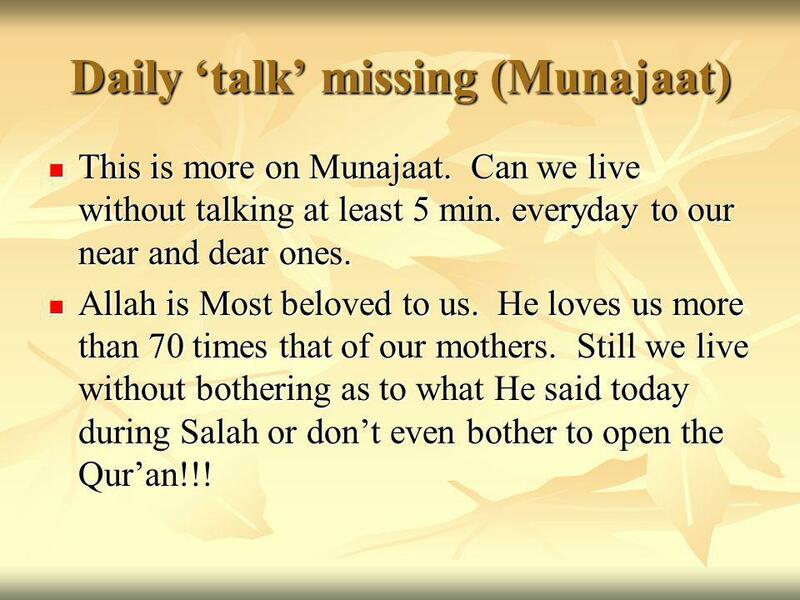 Munajaat (secret personal talk with Allah) More on 4 and 5 in next slides. 7 5. 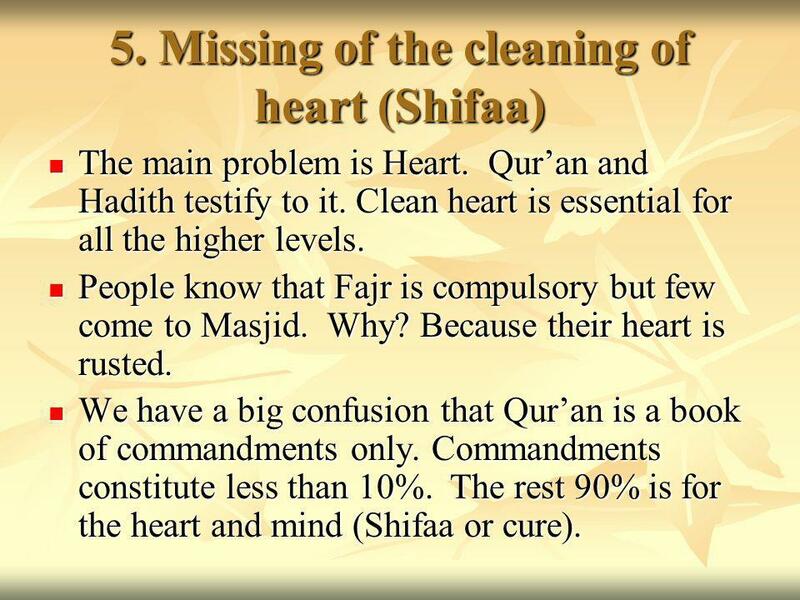 Missing of the cleaning of heart (Shifaa) The main problem is Heart. Quran and Hadith testify to it. Clean heart is essential for all the higher levels. The main problem is Heart. Quran and Hadith testify to it. Clean heart is essential for all the higher levels. People know that Fajr is compulsory but few come to Masjid. Why? Because their heart is rusted. People know that Fajr is compulsory but few come to Masjid. Why? Because their heart is rusted. We have a big confusion that Quran is a book of commandments only. Commandments constitute less than 10%. The rest 90% is for the heart and mind (Shifaa or cure). We have a big confusion that Quran is a book of commandments only. Commandments constitute less than 10%. The rest 90% is for the heart and mind (Shifaa or cure). 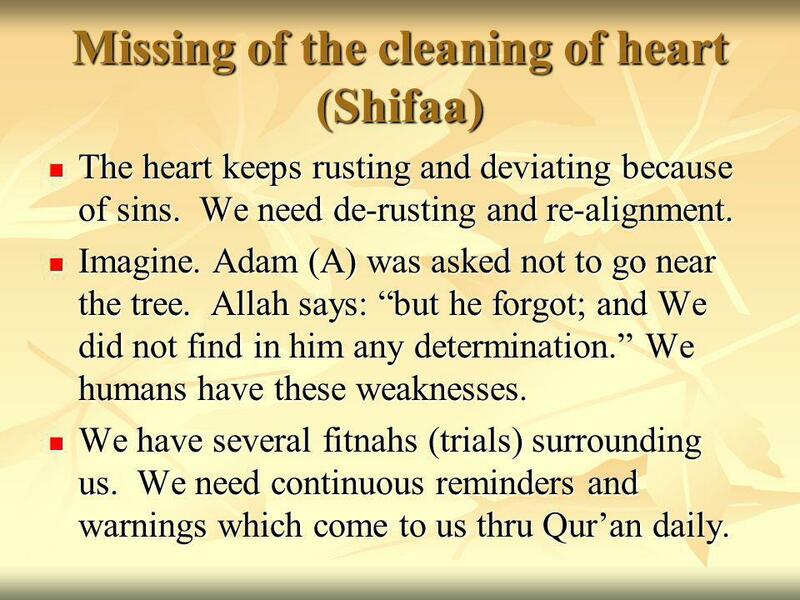 8 Missing of the cleaning of heart (Shifaa) The heart keeps rusting and deviating because of sins. We need de-rusting and re-alignment. The heart keeps rusting and deviating because of sins. We need de-rusting and re-alignment. Imagine. Adam (A) was asked not to go near the tree. Allah says: but he forgot; and We did not find in him any determination. We humans have these weaknesses. Imagine. Adam (A) was asked not to go near the tree. Allah says: but he forgot; and We did not find in him any determination. We humans have these weaknesses. We have several fitnahs (trials) surrounding us. We need continuous reminders and warnings which come to us thru Quran daily. We have several fitnahs (trials) surrounding us. We need continuous reminders and warnings which come to us thru Quran daily. 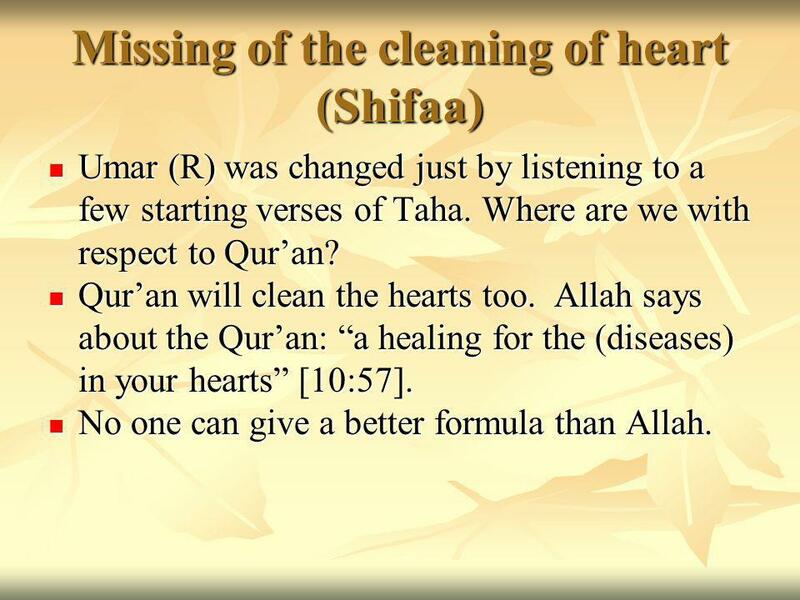 9 Missing of the cleaning of heart (Shifaa) Umar (R) was changed just by listening to a few starting verses of Taha. Where are we with respect to Quran? Umar (R) was changed just by listening to a few starting verses of Taha. Where are we with respect to Quran? Quran will clean the hearts too. Allah says about the Quran: a healing for the (diseases) in your hearts [10:57]. Quran will clean the hearts too. Allah says about the Quran: a healing for the (diseases) in your hearts [10:57]. No one can give a better formula than Allah. No one can give a better formula than Allah. 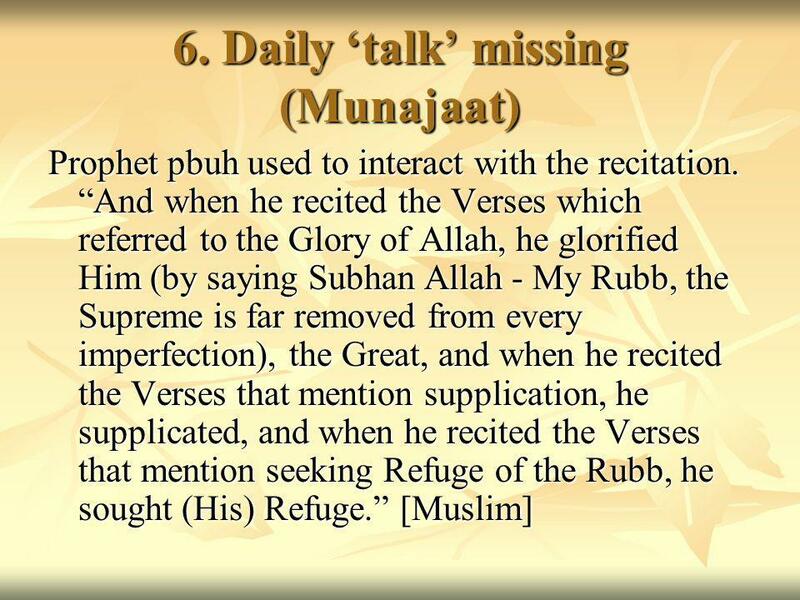 11 Daily talk missing (Munajaat) This is more on Munajaat. Can we live without talking at least 5 min. everyday to our near and dear ones. This is more on Munajaat. Can we live without talking at least 5 min. everyday to our near and dear ones. Allah is Most beloved to us. He loves us more than 70 times that of our mothers. Still we live without bothering as to what He said today during Salah or dont even bother to open the Quran!!! Allah is Most beloved to us. He loves us more than 70 times that of our mothers. Still we live without bothering as to what He said today during Salah or dont even bother to open the Quran!!! 12 7. 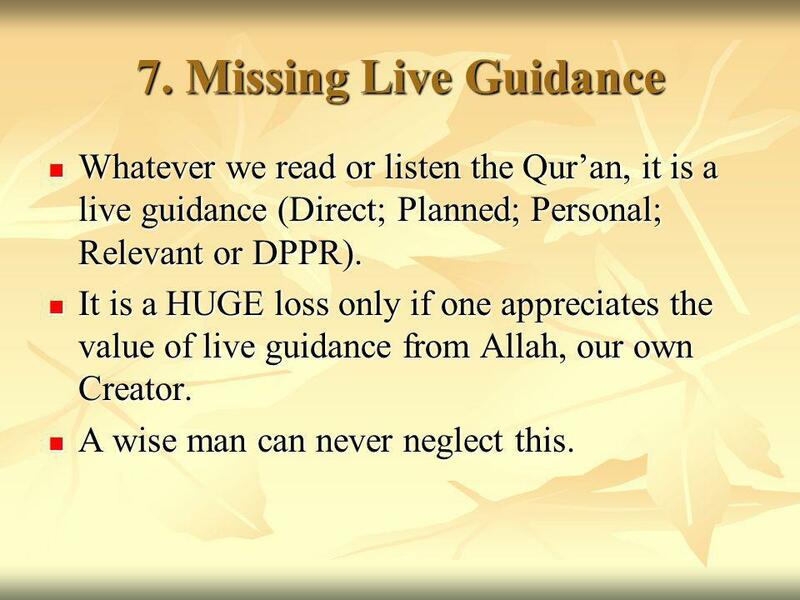 Missing Live Guidance Whatever we read or listen the Quran, it is a live guidance (Direct; Planned; Personal; Relevant or DPPR). Whatever we read or listen the Quran, it is a live guidance (Direct; Planned; Personal; Relevant or DPPR). It is a HUGE loss only if one appreciates the value of live guidance from Allah, our own Creator. It is a HUGE loss only if one appreciates the value of live guidance from Allah, our own Creator. A wise man can never neglect this. A wise man can never neglect this. 13 8. 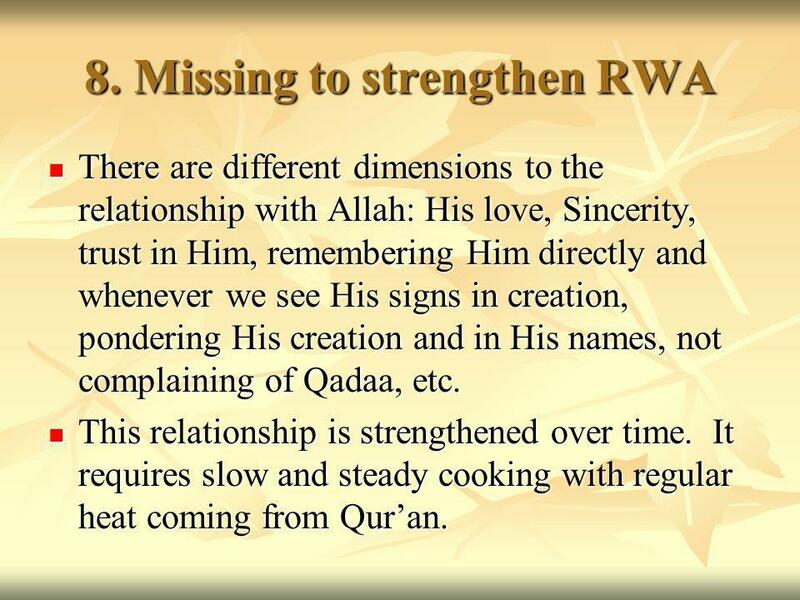 Missing to strengthen RWA There are different dimensions to the relationship with Allah: His love, Sincerity, trust in Him, remembering Him directly and whenever we see His signs in creation, pondering His creation and in His names, not complaining of Qadaa, etc. There are different dimensions to the relationship with Allah: His love, Sincerity, trust in Him, remembering Him directly and whenever we see His signs in creation, pondering His creation and in His names, not complaining of Qadaa, etc. This relationship is strengthened over time. It requires slow and steady cooking with regular heat coming from Quran. This relationship is strengthened over time. It requires slow and steady cooking with regular heat coming from Quran. 16 11. Quranic Vision Example. As a patient starts describing his problems, the doctors mind starts diagnosis along with the medicines. Example. As a patient starts describing his problems, the doctors mind starts diagnosis along with the medicines. During everyday, we come across many situations. We should be able to see solutions in Quran. During everyday, we come across many situations. We should be able to see solutions in Quran. This level does take time and everyday understanding and pondering of small parts helps us in reaching this. This level does take time and everyday understanding and pondering of small parts helps us in reaching this. 19 About Reminder… Allah says about His (beloved) slaves: And they who, when reminded of the communications of their Lord, do not fall down thereat deaf and blind. [25:73] Do we listen to Quran like a deaf person (who does not care to take it to heart) or read like a blind person? Understanding Quran is minimum to avoid deafness and blindness. 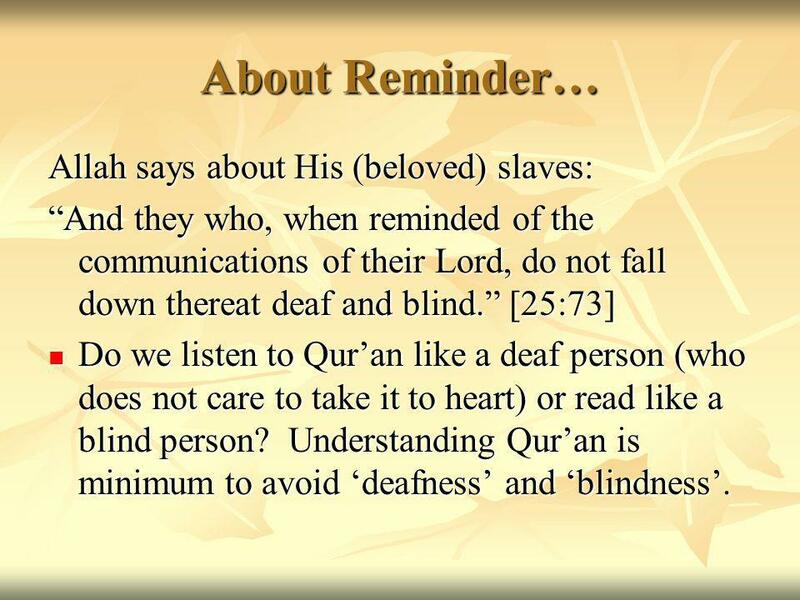 Do we listen to Quran like a deaf person (who does not care to take it to heart) or read like a blind person? Understanding Quran is minimum to avoid deafness and blindness. 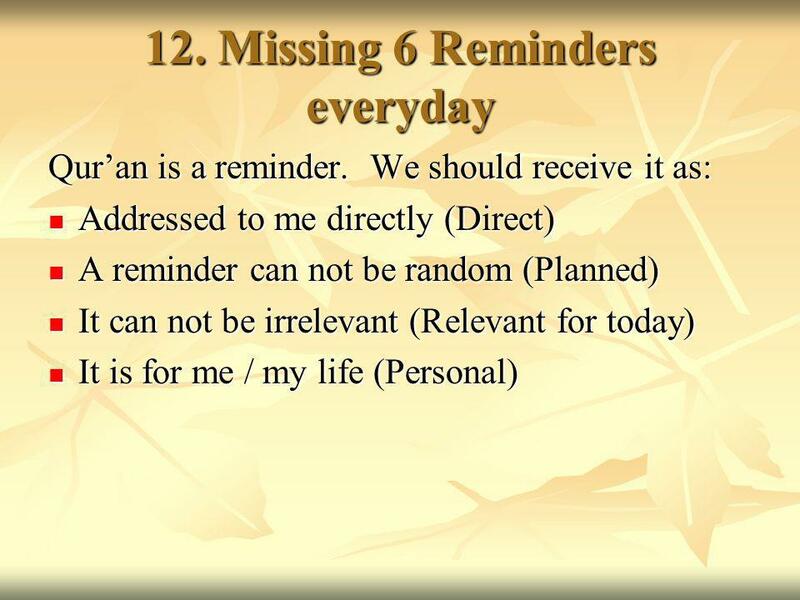 20 Missing 6 Reminders everyday Who is doing that reminder. The one who loves each one of us more than 70 times our mothers do. Who is doing that reminder. The one who loves each one of us more than 70 times our mothers do. 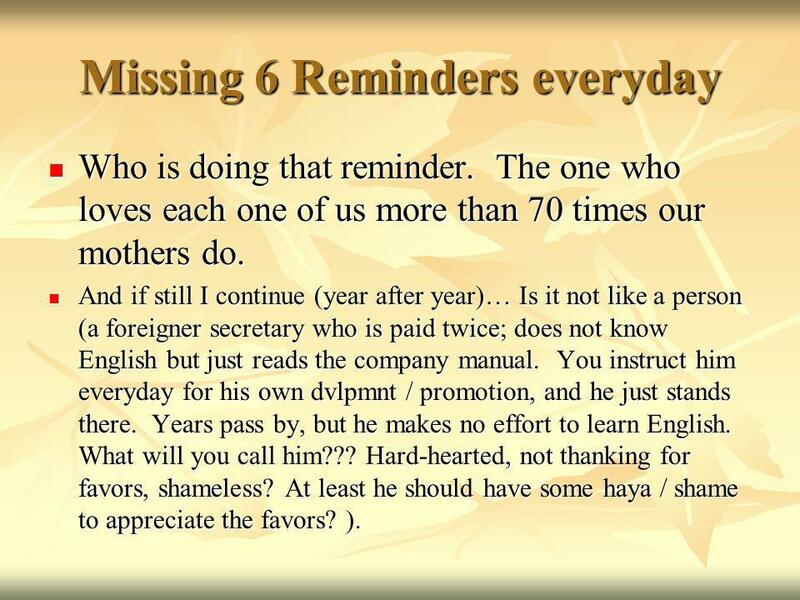 And if still I continue (year after year)… Is it not like a person (a foreigner secretary who is paid twice; does not know English but just reads the company manual. You instruct him everyday for his own dvlpmnt / promotion, and he just stands there. Years pass by, but he makes no effort to learn English. What will you call him??? Hard-hearted, not thanking for favors, shameless? At least he should have some haya / shame to appreciate the favors? ). And if still I continue (year after year)… Is it not like a person (a foreigner secretary who is paid twice; does not know English but just reads the company manual. You instruct him everyday for his own dvlpmnt / promotion, and he just stands there. Years pass by, but he makes no effort to learn English. What will you call him??? Hard-hearted, not thanking for favors, shameless? At least he should have some haya / shame to appreciate the favors? ). 21 13. 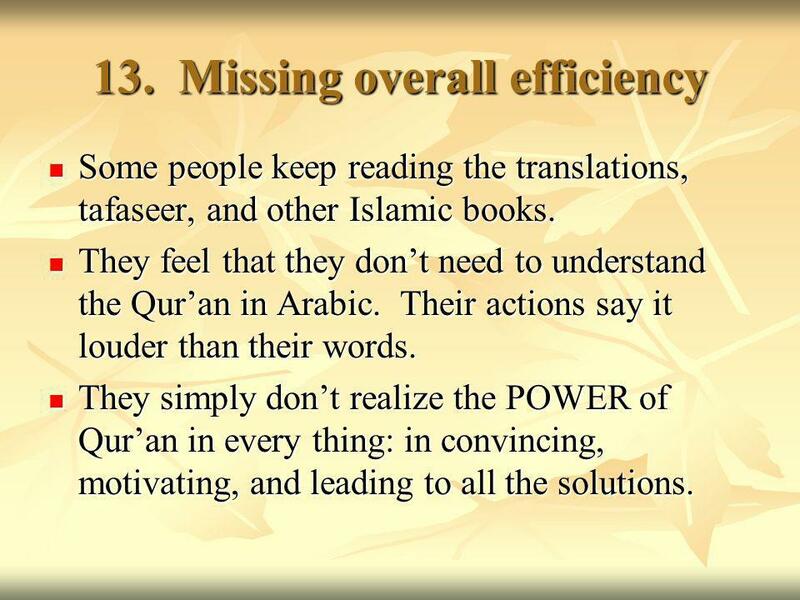 Missing overall efficiency Some people keep reading the translations, tafaseer, and other Islamic books. Some people keep reading the translations, tafaseer, and other Islamic books. They feel that they dont need to understand the Quran in Arabic. Their actions say it louder than their words. They feel that they dont need to understand the Quran in Arabic. Their actions say it louder than their words. They simply dont realize the POWER of Quran in every thing: in convincing, motivating, and leading to all the solutions. They simply dont realize the POWER of Quran in every thing: in convincing, motivating, and leading to all the solutions. 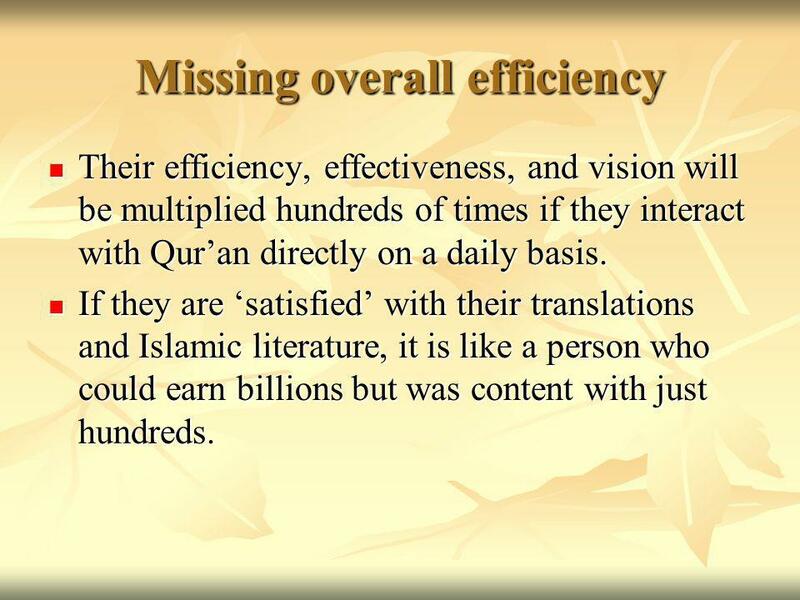 22 Missing overall efficiency Their efficiency, effectiveness, and vision will be multiplied hundreds of times if they interact with Quran directly on a daily basis. Their efficiency, effectiveness, and vision will be multiplied hundreds of times if they interact with Quran directly on a daily basis. If they are satisfied with their translations and Islamic literature, it is like a person who could earn billions but was content with just hundreds. If they are satisfied with their translations and Islamic literature, it is like a person who could earn billions but was content with just hundreds. 23 14. 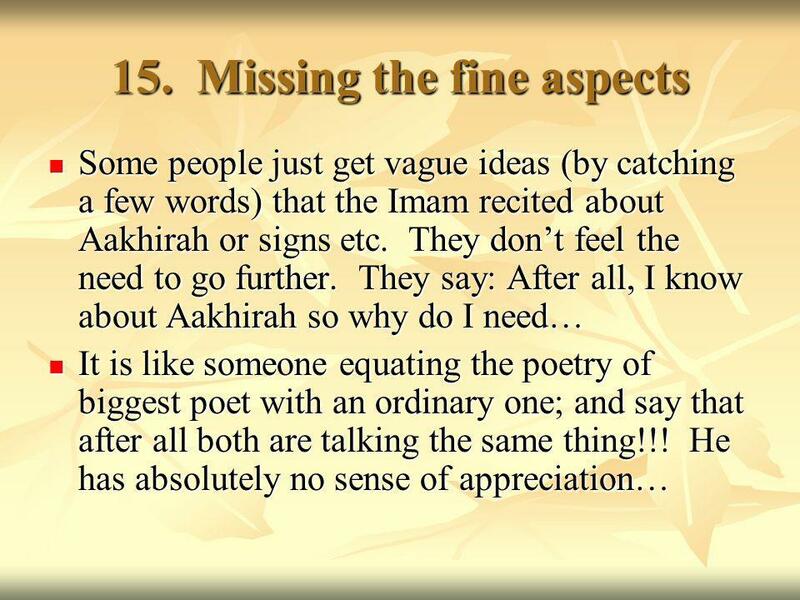 Missing Excellent Opportunities There are times when you want to listen about signs, or commandments or joys of the hereafter or punishments in hell or so on. If you want Allah to talk to you on the subject you want, just open the relevant chapter!!! Signs (Surah Anaam), history (Araaf), story (Yusuf), hereafter (30 th Juz) and so on. 24 Missing Excellent Opportunity Just recite it your self and feel (with firm belief) that Allah is talking to you on that topic. What an excellent feeling!! Especially when you are traveling or waiting or just alone. And if you have memorized the Quran (or a part of it), you can just start listening to Allah! Something like asking your grandma to tell you a story about (your topic), when u were a kid! 26 15. 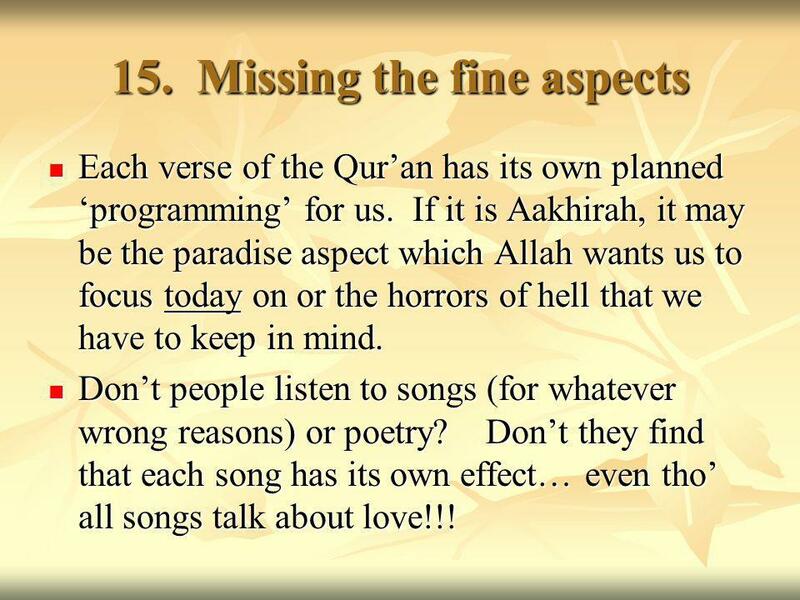 Missing the fine aspects Each verse of the Quran has its own planned programming for us. If it is Aakhirah, it may be the paradise aspect which Allah wants us to focus today on or the horrors of hell that we have to keep in mind. Each verse of the Quran has its own planned programming for us. If it is Aakhirah, it may be the paradise aspect which Allah wants us to focus today on or the horrors of hell that we have to keep in mind. Dont people listen to songs (for whatever wrong reasons) or poetry? Dont they find that each song has its own effect… even tho all songs talk about love!!! Dont people listen to songs (for whatever wrong reasons) or poetry? Dont they find that each song has its own effect… even tho all songs talk about love!!! 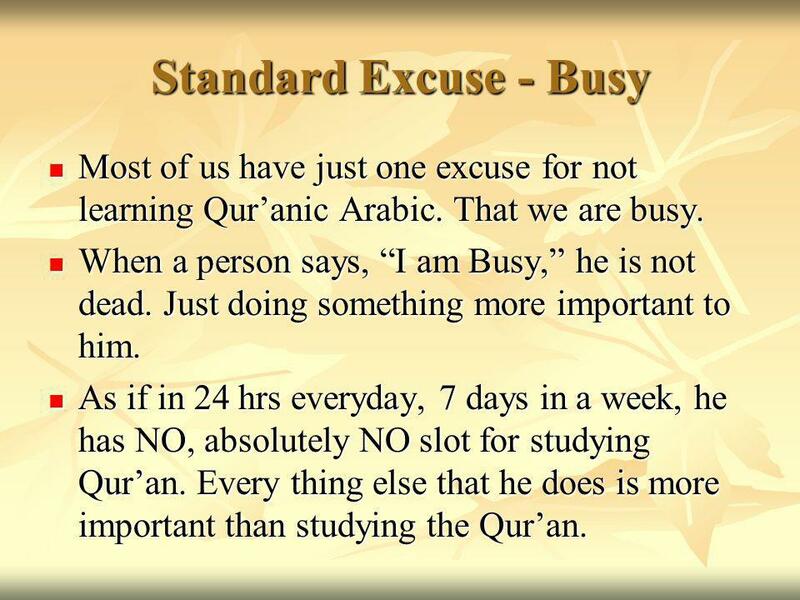 27 Standard Excuse - Busy Most of us have just one excuse for not learning Quranic Arabic. That we are busy. 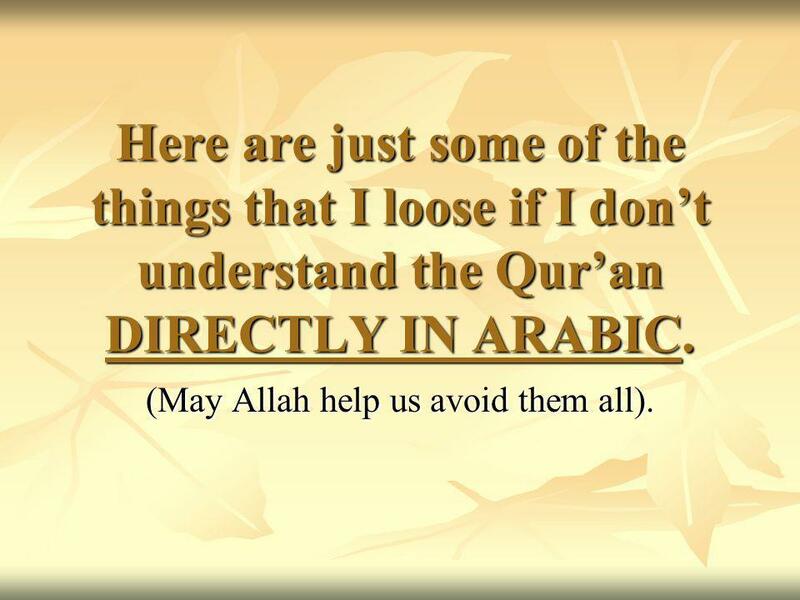 Most of us have just one excuse for not learning Quranic Arabic. That we are busy. When a person says, I am Busy, he is not dead. Just doing something more important to him. When a person says, I am Busy, he is not dead. Just doing something more important to him. As if in 24 hrs everyday, 7 days in a week, he has NO, absolutely NO slot for studying Quran. Every thing else that he does is more important than studying the Quran. As if in 24 hrs everyday, 7 days in a week, he has NO, absolutely NO slot for studying Quran. Every thing else that he does is more important than studying the Quran. 30 If I Understand… 7. Get live guidance 8. Strengthen my relationship with Allah 9. 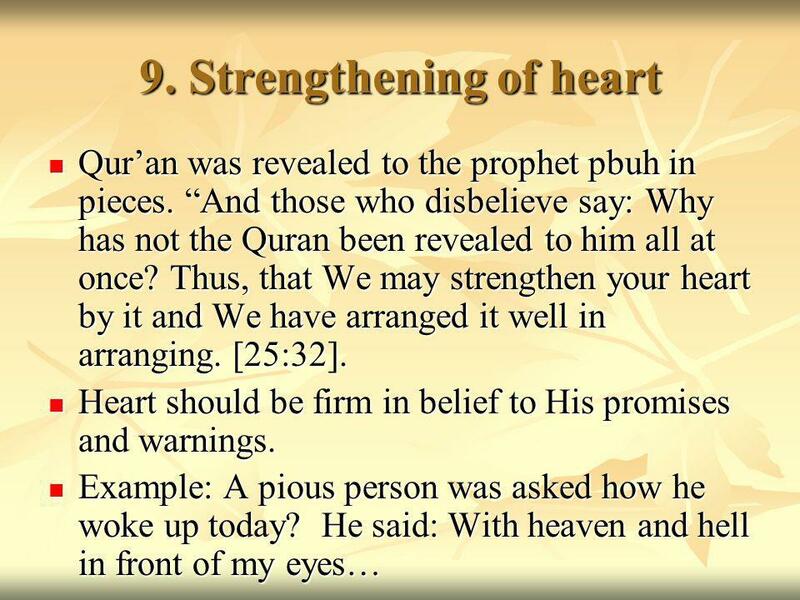 Strengthen my heart (on the commandments of Allah) 10. 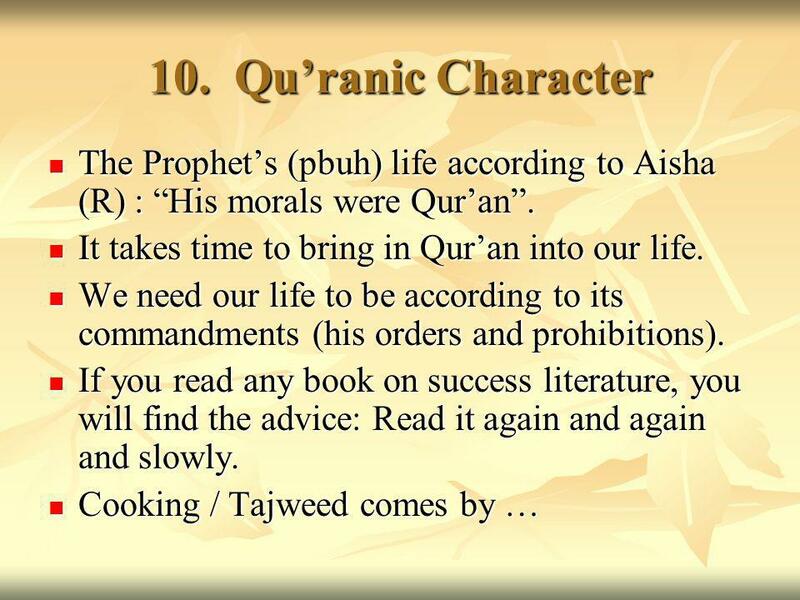 Develop Quranic Character 11. 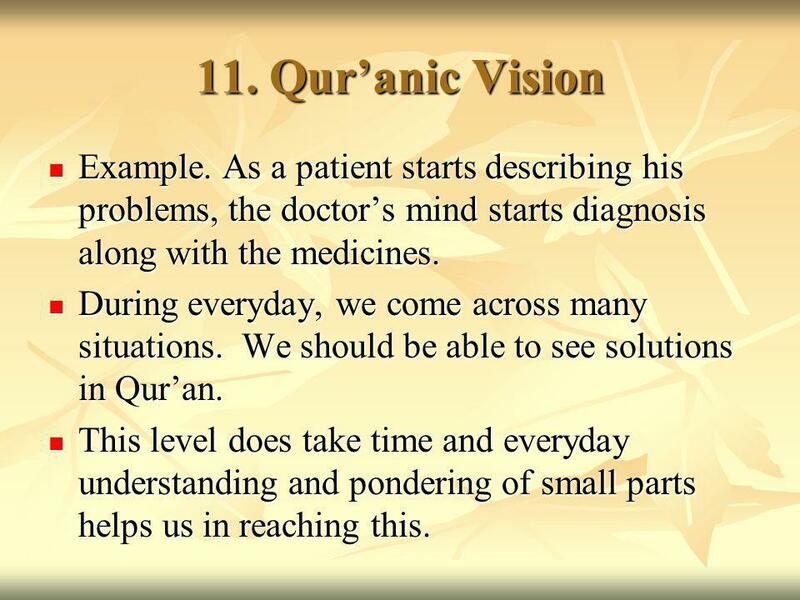 Develop Quranic Vision 12. 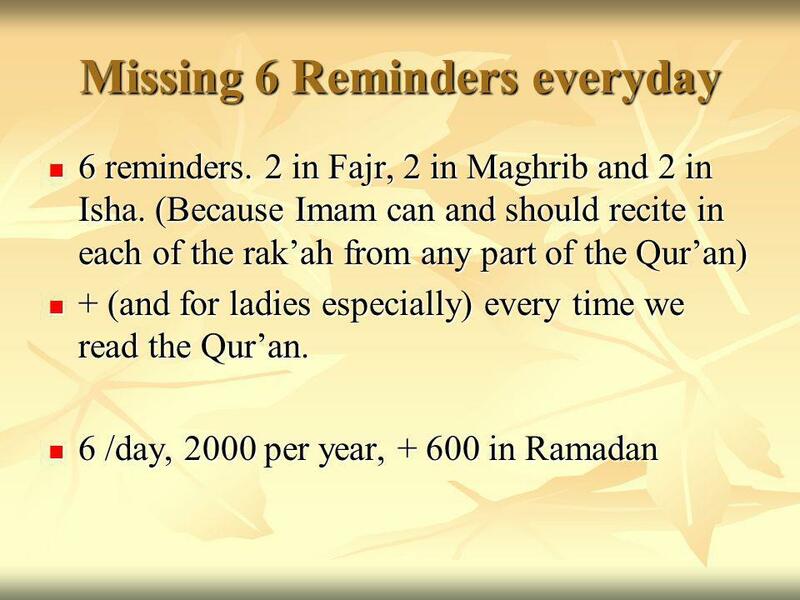 Benefit from all the reminders everyday And improve myself a lot, inshaAllah. 31 May Allah give us Tawfeeq to fulfill all the rights of the Quran. i.e., Believe, Recite, ponder, follow, and spread it. 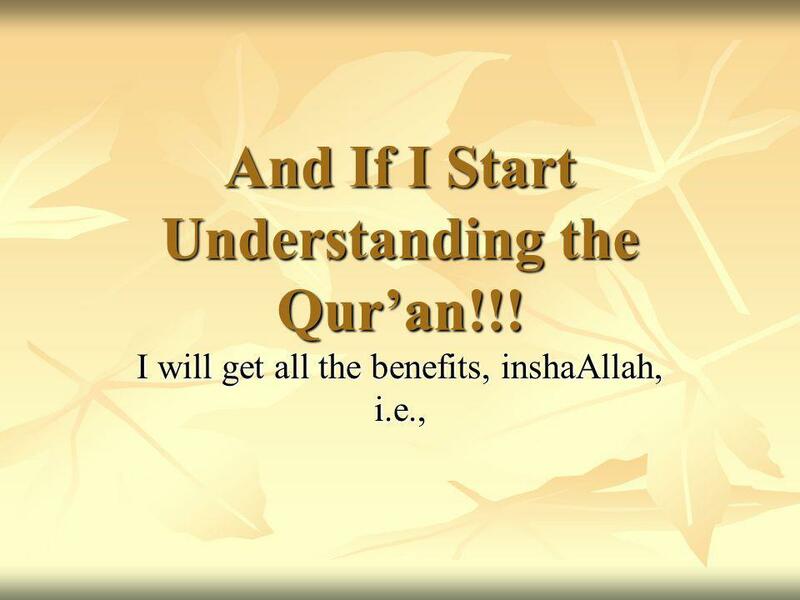 Would you like to start understanding the Quran??? It is extremely easy. Start with the Daily Salah itself. Just click www.understandQuran.com/SCEng.html www.understandQuran.com/SCEng.html And it is absolutely free! 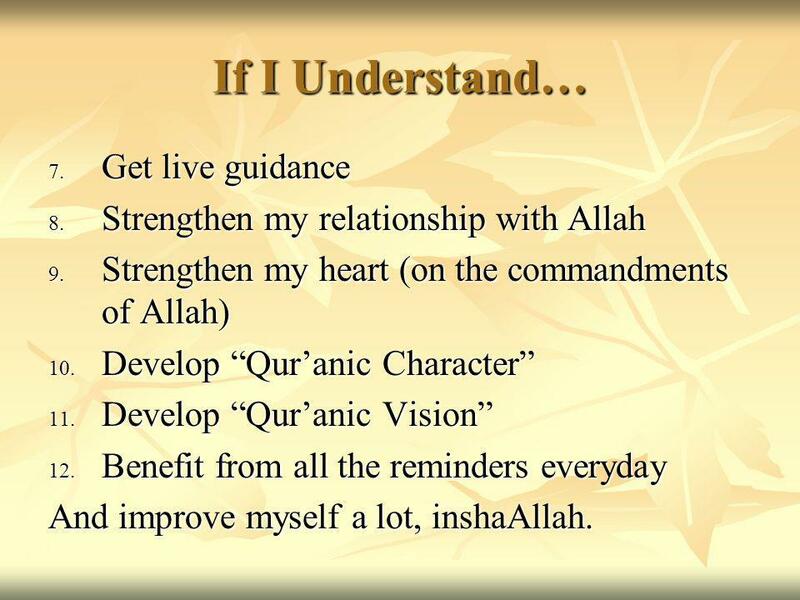 Download ppt "What will I loose if I dont Understand the Quran? Dr. Abdulazeez Abdulraheem www.understandQuran.com In the name of Allah, Most Gracious, Most Merciful." Ramadan Planning If you FAIL to PLAN You PLAN to FAIL. Sayings that lead to heaven. Lets establish among ourselves and obey by heart the laws of Allah to lead a disciplined life and lets pray for the prosperity. Say (O Muhammad): "He is God, (the) One, The Self-Sufficient Master, He begets not, nor was He begotten; And there is none co-equal or comparable unto. WELCOME TO FOG. FOG meeting Pray time! Lets talk to God! He is here ! Pray for: Thank him for today and this meeting. Ask for his help and direction. Exams play a vital role in our life They shape our future Every human irrespective of the age group is constantly writing the exam of life from the time. Al-Qur’an on Salah 1. Guard strictly (the five obligatory) As­Salawât (the prayers) especially the middle Salât (i.e. the 'Asr). And.